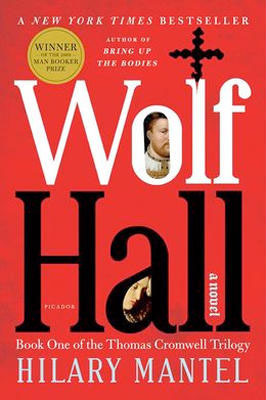 Wolf Hall is technically fiction, but it is meticulously researched and is almost a biography of a pivotal figure in English history. Thomas Cromwell (1485 – 28 July 1540) was an English lawyer and statesman who served as chief minister to King Henry VIII of England from 1532 to 1540. Born to a working-class family, Cromwell rose to become the right-hand man of Cardinal Thomas Wolsey, adviser to the King. He survived Wolsey’s fall from grace to eventually take his place as the most powerful of Henry’s ministers. In that role, he oversaw the English Church’s break with Rome, the dissolution of many monasteries, and Henry’s divorce from Catherine of Aragon and marriage to Anne Boleyn, “Anne of the Thousand Days”. in 1534, Cromwell maneuvered the English bishops and parliament into supporting the separation of the Church of England from the Catholic Church in Rome, thus making Henry the head of the Church and able to approve the divorce. Cromwell was one of the strongest advocates of the English Reformation; a true Protestant. Cromwell supervised the new church from the unique posts of vicegerent in spirituals and vicar-general. During his rise, Cromwell made many enemies, including his former ally Anne Boleyn; he played a prominent role in her downfall. He later fell from power after arranging the king’s marriage to a German princess, Anne of Cleves. Cromwell hoped that the marriage would breathe fresh life into the Reformation in England, but it turned into a disaster for Cromwell and ended in annulment just six months later. Cromwell was arraigned under a bill of attainder and executed for treason and heresy on Tower Hill on 28 July 1540. The king later expressed regret at the loss of his chief minister. Historical and literary accounts in the following centuries have not been kind to Cromwell; in Robert Bolt’s well-known play A Man for All Seasons he is portrayed as the calculating, unprincipled opposite of Thomas More’s honour and rectitude. Until the 1950s, historians had downplayed Cromwell’s role, calling him a doctrinaire hack who was little more than the agent of the despotic King Henry VIII. However, Geoffrey Elton in The Tudor Revolution (1953) made him a central figure. Elton portrayed Cromwell as the presiding genius, much more so than the King, handling the break with Rome and the laws and administrative procedures that made the English Reformation so important. Elton says he was responsible for translating Royal supremacy into Parliamentary terms, creating powerful new organs of government to take charge of church lands, and thoroughly removing the medieval features of the central government. One can argue that Cromwell matters not only in English history, but in European and American history as well. Without him, would there have been a divorce? A Queen Elizabeth, daughter of Anne Boleyn? Protestants and Puritans to settle New England and create America? Perhaps all the New World would have been Spanish; no great wars of the twentieth century between Industrial England and a rising Germany. Cromwell, the “other man” in the great struggle of Henry VIII against Rome – you think you know him, but you don’t. Without Cromwell, Henry VIII might have remained as famous as Henry VII. Hilary Mary Mantel CBE (born 6 July 1952) is an English writer whose work ranges in subject from personal memoir and short story to historical fiction and essay. She has twice been awarded the Booker Prize. She won her first Booker Prize for the 2009 novel, Wolf Hall, an account of Thomas Cromwell’s rise to power in the court of Henry VIII. She won her second Booker Prize for the 2012 novel, Bring Up the Bodies, the second instalment of the Thomas Cromwell trilogy. Mantel was the first woman to receive the award twice. The third installment to the Thomas Cromwell trilogy, The Mirror and the Light, is set to be published in 2015. Was Cromwell amoral or just plain corrupt? Was he, as some say, just a bureaucratic functionary, a hack doing his boss’s will, or was he pursuing a true vision and belief of his own? The Tudor period was not without violence, and Henry had many mistresses. However, Wolf Hall does not dwell on these aspects of Tudor life. The book may not be suitable for yonder readers, but older teens and young adults will not find anything they haven’t heard or read about elsewhere.